One of the things I enjoyed doing while traveling the world as a correspondent for the Chicago Tribune was writing stories for the paper’s once-prodigious and highly-respected travel section. Writing travel stories provided me with a change of pace and allowed me to focus on the where in addition to the why and the what of any story I was covering. 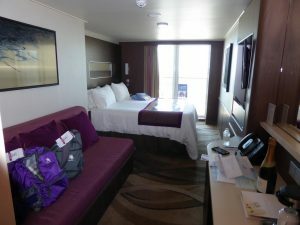 Having just returned from a seven-day cruise aboard the Norwegian Escape—a year-old leviathan of a ship almost 1,100 feet long, weighing 165,000 tons, with 20 opulent decks—I thought I would share with you some impressions about my first-ever cruise. I was pleasantly surprised to discover that was not the case. With a crew of 2,200 to serve 4,500 passengers and with 29 restaurants and bars, we never found ourselves standing in line. 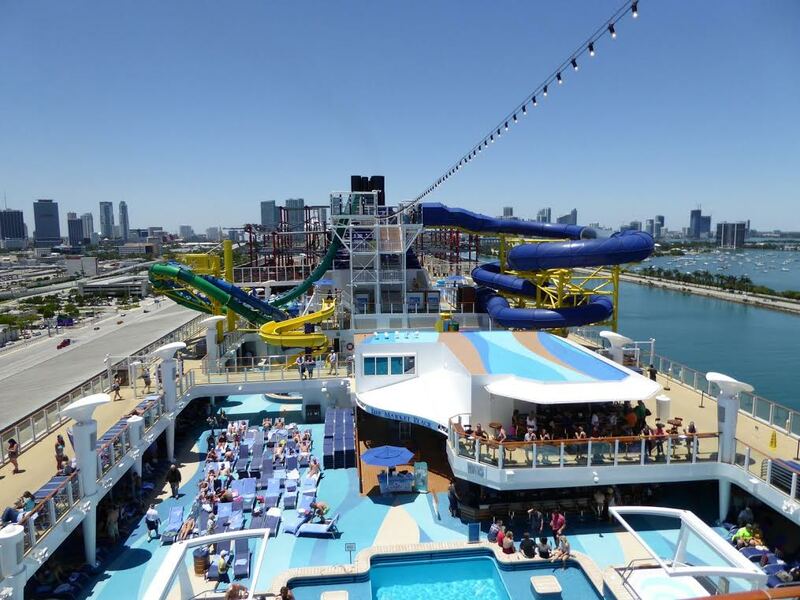 The Escape offers something called “freestyle cruising.” That means, there is no fixed schedule for dining and no pre-assigned seating. There are no dress codes, though most people dressed up a bit for dinner in the specialty restaurants. That usually meant people didn’t show up wearing flip-flops, grubby shorts, or grungy blue jeans purposely mutilated with rips and tears (a fashion statement I will never be able to fathom). For those who wanted to eschew the ship’s surfeit of dining possibilities, there was also 24-hour room service. The ship departed Miami on a Saturday night and returned a week later on Saturday morning. For the first two days, we were at sea headed for St. Thomas, the U.S. Virgin Islands—a group of tropical isles discovered by Christopher Columbus in 1493. A day later we were in Tortola, the British Virgin Islands and finally two days later in Nassau, The Bahamas. Perhaps the most surprising thing about sailing on a ship this size was the complete absence of any sensation that you were in the middle of an ocean. There was seldom any sense of motion as the ship sliced through the Caribbean. The ocean was calm with waves never more than four to six feet high and winds never reaching more than 20 or 22 knots. I am sure if we had encountered a storm the experience would have been much different. We booked a mini-suite with a balcony. The cabin exceeded our expectations—in both size, comfort and privacy. Not once did we hear any noise from other cabins and the balcony was an excellent plus if you wanted to relax, read and watch the ocean slide by. A challenge with a ship this size is the embarking and disembarking process. You can imagine what might happen if all 4,500 passengers decided to disembark at the same time. When we arrived at St. Thomas, Tortola, and Nassau we found that island tours and activities were staggered, so passengers didn’t all leave the ship at the same time. For the most part, that worked pretty well. Some passengers who had been to the islands on other cruises eschewed the disembarking experiences altogether. With probably 4,000 fellow passengers scurrying around the islands on tours, shopping, snorkeling, swimming, or broiling like Chicago hot dogs on white sandy beaches, those who stayed behind had the run of the ship. Never having been to any of these places before, we chose to disembark. In most cases we had four or five hours to explore and enjoy the experience of being on dry land again. Then, it was back to the ship, which we were told, would wait for no one when it came time to hoist anchor. Now for some of the negatives. First, noise—specifically, music. 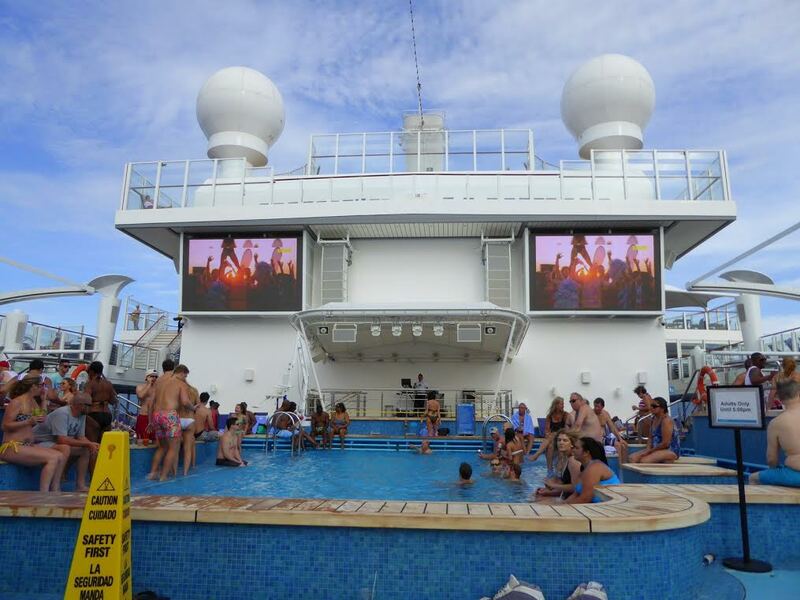 Around the pool located on deck 16, rock music was cranked up to levels so loud that it was painful. You could feel the sound waves penetrating your body. Thank god, this normally didn’t occur until about noon. Before that, you could recline on one of several hundred deck chairs, read a book and watch the parade of people as they scrambled desperately to find vacant pool recliners. But once noon hit, we left. And the earsplitting, loud music didn’t stop for hours, nor was it confined to the pool area. It seemed like every venue that produced music felt the need to deliver a stridency of sound that often approached 115 decibels—the standard noise level for sandblasting and rock concerts. Acoustic experts say pain begins at 125 decibels—for example the noise a pneumatic riveter or a jet engine makes. For those of us who still happen to possess normal auditory ranges or undamaged ear drums, we found it best to retreat to other parts of the ship rather than attempt to carry on a conversation with friends or acquaintances by screaming at one another. My next negative comment may sound harsh, but it just must be said. I have never seen so many obese and grossly overweight people concentrated in one place in my life. The reason for that is obvious. Food. Mountains of it. And it was all included in the price of the cruise. That led me to conclude that there are different categories of people who chose to go on a cruise. First, there are those who want to see new places and enjoy the comfortable experience of sailing the seven seas to get there. These people read, make new friends and mostly take it easy. Then, there are those who want to party hard and relentlessly drink themselves into a state of oblivion. Complimentary alcohol was also included on the Escape—depending on the cruise package you selected. (These are the same people, I suspect, who don’t mind having their hearing obliterated by the earsplitting disharmony and dissonance on the pool deck). 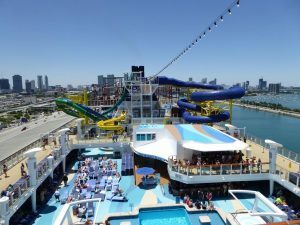 Next, are families who come with their kids, grandparents, aunts and uncles to enjoy the variety of first class entertainment offered on the ship—from shows and concerts to zip-lining and water-sliding, to video arcades and a surfeit of other onboard activities geared for all ages. 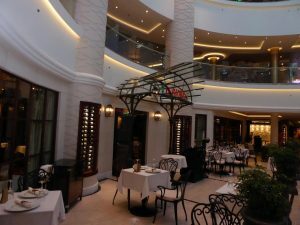 Finally, there are the foodies who book a cruise in which the primary activity seems to be to consume as much food as possible from bow to stern in the shortest amount of time. 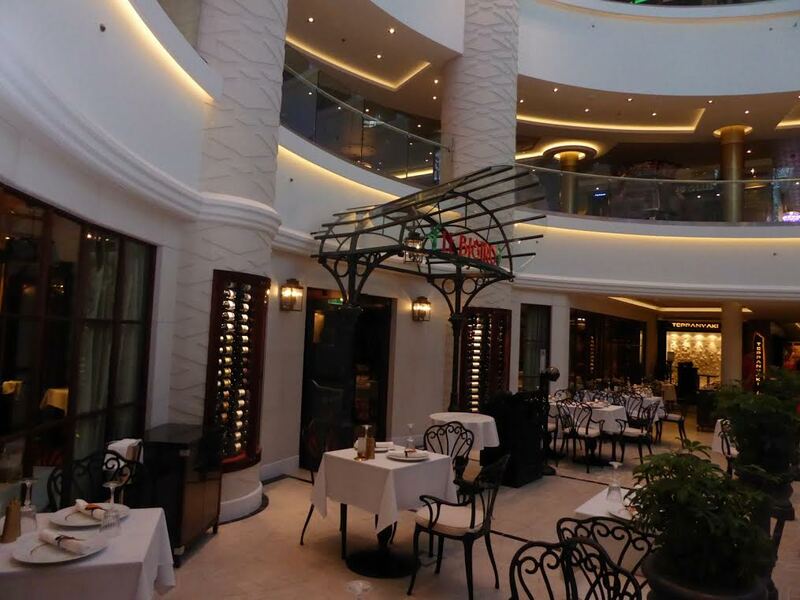 Believe me, with 29 restaurants on the Escape that is tough to do during a seven-day cruise. But looking at some of the corpulent gourmands and bon vivants I saw aboard the Escape; I am convinced they were giving it their best shot. One problem, if you want to call it that, is the quality of the food. It is absolutely top notch, and therefore, way too tempting. It takes great self-control to refrain from loading your plate with hillocks of the grub in places like the Escape’s Garden Café—a sprawling self-service buffet restaurant with something like 20 serving counters heaped with a cuisine of every description and for every taste served in a surprisingly well-regulated and comfortable environment that seats close to 1,000 people. At one point I was talking to a cardiologist who was a passenger on the Escape about the substantial numbers of grossly overweight people on board. “I see heart attacks walking—and if not that, then diabetics in the making,” he said. Of course, that isn’t the Norwegian Cruise Line’s fault or responsibility. Its job is to provide a quality experience for its passengers, no matter how much they indulge themselves. And it does that. As enjoyable as this experience was, I think next time I will opt for a smaller ship—perhaps one with 1,000 passengers or less. The problem with a ship the size of the Escape is that when you meet people you enjoy talking to, chances are you will never see them again because of the vessel’s colossal size and the sheer number of passengers. Finally, a word about the crew—the stewards, waiters, waitresses, busboys (and girls), cooks, technicians, hostesses, pasadores, bakers, counselors, bartenders, deckhands, lecturers, entertainers, massage therapists, security personnel, and many other jobs that few passengers are even aware of. On the Escape, we were told that fully 60 to 70 percent of those who interact with passengers are from the Philippines. Another 20 percent were from Indonesia, Thailand, China and a smattering of East European countries. It is about the same for other cruise lines. The reason? It may have something to do with the pay these hardworking people receive—anywhere from $400 to perhaps $600 per month, depending on the job. Supervisors and those with seniority earn more. While the pay may seem small when contrasted with American or European salaries, it amounts to a substantial amount when you consider the kind of poverty-stricken countries many of the crew come from. 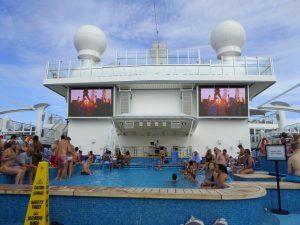 Then there are the tips and gratuities as well as the service fees that are added to the cost of a cruise. A cabin steward who is responsible for 10 or 15 cabins often receives tips ranging from $20 to $50 from each of the cabins he services at the end of a seven or 14-day cruise. And, I might add, it treats its passengers pretty well too—though next cruise; I will bring noise plugs.